Ballina Maths teacher Eamon Toland who runs mathstutor,ie has prepared a video on the error that appeared in the Leaving Cert Higher Level Maths Paper 2. yesterday. The video which shows clearly what the errors were, and what the implications would be for students. 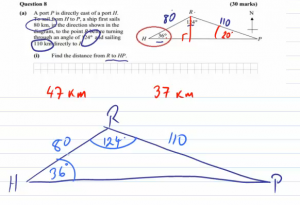 Question 8 on Paper 2 was a trigonometry question based on a navigation scenario. The English language version had an extra piece of information in it, which was not required, and in fact caused the question to become invalid, by creating a mathematical contradiction. Students may have noticed this, or may have proceeded without realising. Depending on the method used, different solutions were possible. More advanced students may have realised this and become confused. The Irish language version did not have the extra info, and as such was a valid question. However, ironically, students were alerted to the omission, and told to include this information, thus rendering the question invalid. There was another error in the wording, where an angle specified in the description was not as represented in the diagram given. This was a less serious error, but also unacceptable. The State Exam Commission has admitted to issues with the paper, and have undertaken to take them into account in the marking schemes.